(March 4, 2007) Charlotte-Douglas Airport will be constructing a new, fourth runway west of the current airport beginning this year. 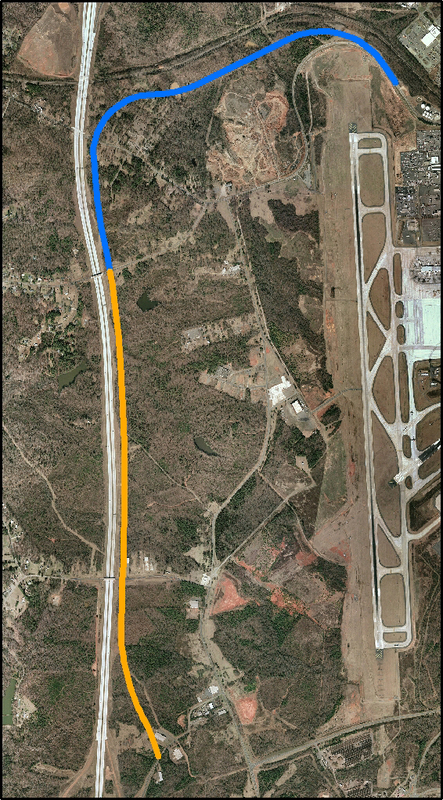 Because the new 9,000 foot runway will displace the current Wallace Neel Road and part of Old Dowd Road, the airport must construct an alternate route around the northwest and west side of the airport. Current plans place this road along the eastern edge of I-485. In the aerial photograph below, the blue line is Phase 1 (relocation of Old Dowd connecting to Walker Ferry Road) and the orange line is Phase 2 (from Walker Ferry Road south to West Boulevard). Expect to see a variety of detours and other reroutings until the replacement road is completed. The new runway is scheduled for completion in 2010, but the new road should be complete before then. West Boulevard also will be relocated southward to accommodate an extension of the current western runway to the south. A schedule for this relocation has not been announced. Watch for further updates on the Charlotte-Douglas International Airport web site. Also see Roads being moved to make way for runway (3/8/07) By Kirsten Valle of the Charlotte Observer. According to the Dixie-Berryhill Thoroughfare Plan adopted in 2002, the replacement road was expected to have been built on the west side of I-485 (following the gray line on the map below). A revision to the alignment of roads through Berewick (the blue roads on this map) was approved in 2006. See the story New Intersections on Steele Creek Road Approved and Funded but not Scheduled (December 18, 2006). Also affecting roads in the area will be the proposed Gaston Connector, which will extend west from the end of a realigned West Boulevard, cross Lake Wylie, continue through southern Gaston County, and connect to I-85 west of Gastonia. See the story Study Underway for New Gaston Connector (February 4, 2006).